This pleasant, brown-brick, neo-Renaissance apartment building at 14 East 90th Street was erected in 1928 and designed by J. E. R. Carpenter whose other buildings on the Upper East Side include 810, 907, 988, 1030, 1070, 1120, 1150, and 1165 Fifth Avenue and 580, 625, 640, 655, 812 and 950 Park Avenue. The building has a canopied entrance, a three-step-down lobby, a gym, a children's playroom, a mini-basketball court, caged storage and sidewalk landscaping, but no garage and not bicycle room and no roofdeck. It is just to the east of the Church of the Heavenly Rest and the Trevor Day school and down the block from the large garden of the Cooper-Hewett Museum of Design. 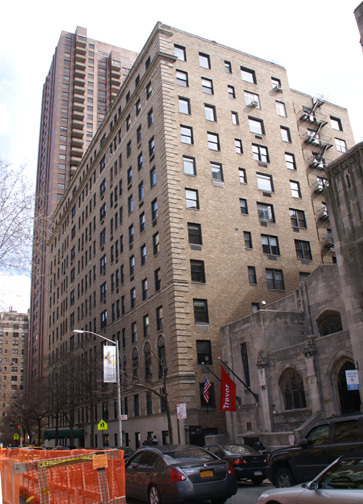 Its Carnegie Hill neighborhood abounds in private schools and museums. The 12 story, brown brick building has 50 cooperative apartments, quoins, protruding air-conditioners and a doorman.